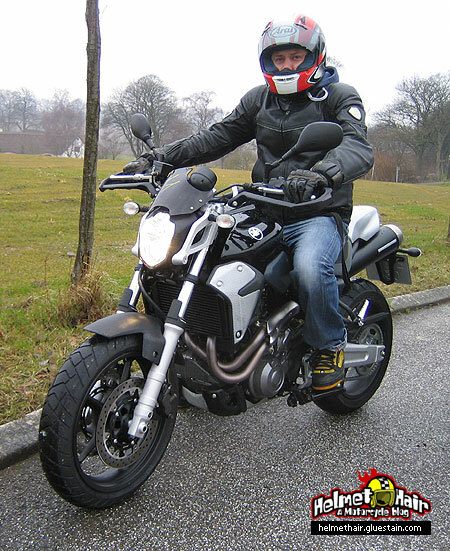 I had the chance, a few weeks ago, to take a Yamaha MT-03 for a quick spin. As far as I know Yamaha has used the engine from the XT 660 and put it in a more modern sci-fi-like chassis. If you’ve read my opinion on the XT 660, you will now that I was thrilled by its high fun factor. The MT-03 ranges equally high in fun factor and higher in design factor and use possibilities. In fact I can’t really shake the bike from my mind. It’s the best choice of a short range traffic cutting fun package I’ve tried yet. You have the kind of weird (but fun) upright riding position of an off-roader/motard, that gives you good traffic overview. The wide handlebars makes it extremely easy to handle and feel very steady and stable. The sound of the single cylinder 660cc engine is a beauty, and the low range pull is quite nice as well. I didn’t have the chance to ride with a passenger, but it looks like the passenger seat is on the comfy side compared to that of the XT-660. It has grab rails, so how bad can it be. I recon it will do just fine for some evening show off rides around town with your spouse. I wouldn’t take it for a cross country baggage packed two-up tour. But should I ever need a bike for daily commuting, which also has some spunky street credibility; the MT-03 is very high on the short-list. If you are a beginner and considering this as your first bike, I’d say go for it. It has just the right amount of power, forgiveness (excellent brakes without being too aggressive) and high potential to keep a big fat grin on your face for years to come. I’d love to see a Ducati-Multistrada-like 1000cc model of the MT-03. That would make a serious replacement option for my present Honda 919.
hi buddy, well what can i say about the mt-03. when i test rode the machine i could not get the smile of my face, i rode it back to the dealership and paid my deposit. one week later i took delivery of the bike. as you read in the blog, i took the bike around the uk with another three guys, i had no problem keeping up with any of them and managed to put them all to shame as we tackled the twisty A roads. the bike comes alive and just loves these type of roads. i thought about selling the bike to buy the new bmw 800 gs but when it came to it i just thought, well maybe one more summer on my mt-03. so that is where i am at with the bike at the moment. the machine is very true and trustworthy. although i have riden bikes for many years this is a machine that is sutiable for most people, it is fantastic on the A roads easily sits at 80 on the motorway, although i would reccomend a GIVI screen (good price and very easy to fit) great in traffic when filltering (easy to handle at low speads) the fun factor for me is when you come off the gas the exhausts make the most fantastic popping sound, very loud and very cool. well as you can see 18 months on and im still looking for them. this is an honest opinion. i have no regrets. also anyone out there as short as me you can rest easy im 5’3 and have had the bike lowered a touch, this has not affected the handling in any way. let me know how you get on if you do decide this is the bike for you. good luck. I took my cbt in january 2009 and the full test in February 2009, i never ridden bikes before appart the Suzuki GS500 from the learning school. I went to George White in Swindon and get myself a Brand new MT-03 wich rides lovely. My mate has got a Suzuki V-strom and he loves my bike. They are pure fun. push the select and reset buttons together and turn the key on. when the digits start flashing on the display,push the select button to choose kilometers or miles. Just to let you know that i agree with all thats been said here,the 03 is a stunning little bike,and it is a rare site on the roads where i live! It gets some seriouse attention wherever i park it. Its not all show and no go either! it handles like a dream ,and is as forgiving as my old 535,but much more fun! GET ONE -YOU WONT EVER REGRET IT! Just bought an MT-03 last week cant believe how easy it is to ride. Would have to agree with Keiran it’s getting a lot of attention! Why not in the US?????? i have just bought an MT-03 as a second bike,like you say no matter where you park it, it gather attention,got the best of both world’s as my main bike is an MT-01. Just a few words about the MT03. I had the bike for 2 months and did about a 1000 km in the meanwhile. As a first bike, it’s more than I expected. Back from a day trip in the french pyrÃ©nÃ©es mountains, I confirm the bike is incredibly fun on the twisty secondary roads (much more fun and easier than the 1200 harley davidson roadster my daymate was using today). No regrets, I’ll look for a road test of a KTM Duke to see if that maybe a future option..
Hi there, this is TiagoS from Spain. Has anybody riden the mt-03 off-road? My girlfriend has a Suzuki Van Van and I would like us to ride offroad together. Another question, is the MT-03 comfortable for the passenger? Not too big trips, only 300-400 miles. Hi Celtic Frost I own a MT-03 for a year now and its been fabullous, the bike as been in mud, water, gravel and Sand with no problems at all, the only thing i changed was the tyres for Continental Road Attack for more grip especially on the wet. 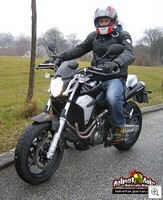 My ridding partner as a KTM 690 SM and its a great bike as well but not so confortable for a bit longer journeys. If you want the bike just for local rides and town get the KTM but if you plan going for something more confortable get the MT-03. Interesting reading, I am thinking of getting a new bike soon. I have owned a Hyosung 250 comet for the last two years, I live on an island in Spain with good year round riding. I am bored of my Hyosung’s capabilities, engine and looks and want to step up to either of one of these bike, just can’t decide. The only pulling point is that my Hyosung dealer will give me a 1200 euro trade in against the Kawasaki, I’d be left with the bike and have to pay the full 6250 euros if I bought the MT 03, which I prefer the look of but I believe has not as much perfonrmance? For all of you stateside who are wishing Yamaha would resume offering street/scrambler thumpers we’d use and enjoy instead of heavy, expensive play-racers and low-riders, get on http://www.yamaha-motor.com and tell them about it. The fabulous 660 engine – now 686cc – is confined to glorified golf carts in the US, meanwhile nothing fills the gap of substantial, fun, and useful street/scramblers that got so many of us riding and enjoying bikes in the first place. But i have one major question that i need to know. My friends want me to come down to Le Mans with them next year. Will this bike make the trip through france adequatly? will the fuel stretch? will the bike be fast enough and will it be comfortable enough to last a 2-3 hours riding at a time? Thanks guy, this will be the decieder over getting it. In reply to above, great bike to commute. Very light and fun to ride. The fuel tank is not the biggest and would stuggle on motorways etc over long distances. You may struggle to keep up with your mates too! Having said that I love it and am keeping mine! Hope this helps you choose. i have an 03 aswell as its bigger brother the 01.
recently i took the 03 on a 300 mile trip round the scottish/english border with a few fellow mt owners.I have to say i was well impressed with its performance,tank range was roughly 100 miles,on the motorway it will easily at 70/80mph. I was just browsing for parts for another bike when I found this page, nice to see the interest in the MT-03. 4 years ago my Honda 450 Supermotard was stolen and I was out looking for a new bike. I was looking at buying something practical ( and boring I thought ) and stylish, i checked out the Ducatis, the Hondas and all the “mid-range” 600-800cc bikes. I didnt have a lot of cash and the insurance was a joke so instead of waiting for more money and letting the summer go to waste I decided for the MT-03, i didnt even do a test run with it! Deperate I know! Now almost 5 years later I have taken really long trips with it, stunting it, city traffic, snow and rain AND I LOVE THIS BIKE! I have done some modifications to it and purchased some alternative parts. The exhaust from Akropovi is maaaad! It also added power to the bike. After this and my friends fingers in it i top out at 196kmh, as long as you rev this bike it will keep up with all of the bikes in the same range until you hit top speed, start in number two gear and you leave Ducatis standing. Yes, no windshield and stuff so it will be windy but this is a “naked bike” and for people who dig the wind itÂ´s awesome. Riding any naked bike will require some “holding on” when above 150kmh. Next month I will have them map it and with a power commander I think it will reach 200 and thats all I need. I made the suspension a bit stiffer and iÂ´m lowering it soon. This is after almost five years with the bike, and I still love it. I might have some picÂ´s on my Facebook account if your interested. Hi Im from Greece and bought the last mt 03 available in the whole country on this special offer 09 model for 5380euros. I used to have a yamaha drag star 1100 classic but i sold it a few years ago and ive always wanted to get another bike and love the mt. The drag star weighed 270 and it wasnt convenient. What a nice change. I went to the dealership rode it for 15 km then it started raining. I wanted the white one but got the black one in the end and it looks great. I think i might paint the gas tank black mat to match the rest of the bike and put a white sticker strip around the wheels to match the awesome side mounted white suspension. Yamaha have done a great job and the bike should be reliable, fun, and easy to maintain. Cant wait to ride it. Thanks for all the comments. Very nice to hear from so many mt 03 owners from all over the world. Take care dudes…Safe riding!!!! Well, I am now the proud owner of an 06 MT 03 in white. I never had a test ride on one, liked the looks and just bought one. Picked the bike up this afternoon and having ridden it for the last 4 hours these are my first impressions of it. 1. It is freckin AWESOME!!! 2. Power delivery is very very good in all gears and speed is NOT an issue in any way. 3. The handling is amazing. 4. Brakes are very very good. 5. Motorway riding is fine, don’t believe the scaremongers. Took it on and just went one junction but managed 95MPH and it still felt good. If you have ridden naked bikes before its exactly the same, windy, but fine. If you are thinking about this bike GO for it, it is a really really really good machine. HI there. I read most of the comments about the MT03. To tell my little story: I’m 63 (passed midlife crise and arrived in old age crise) Fact is that in March of this year (2010) one of my friends told me that he had booked in September an arranged motor bike holidy trip in the US. 4 Corners trip it’s called. Riding around in 5 states AZ, UT, NM, CO and NV of course on a HD. First thing I asked “Can I join you on the buddy seat?” But right away I said no buddy seat; I’m going to learn to ride. Started in April and 30th July I had my license. Another friend borrowed me his old Kawa 454 LTD (87) to practice. Rode on it for about a month, Great fun. That old Kawasaki brought me to the local Kawasaki dealer (rpm-counter broken cable) and there I saw her. The Yamaha MT 03 shining in the showroom between hard green Kawa Ninja’s and other for me too big and too racy bikes. It is from ’06 and 5000 km’s for a bit less than â‚¬ 5000. The dealer offered me to try it out but unfortunately the battery was empty and at that moment I didn’t have that much time. I thought it was a twin because there were two exhousts but reading the specs on the internet I found out that there is only one cylinder of 660 CC. 45HP, that old Kawa had 60HP and two. So I started to doubt. But having read all the exiting comments about the bike I must try it out. It is something very different from a HD Sportster 883 that I’m going to ride in the US but nevertheless….. We’ll see. Every “normal” motor biker advises “never by a Harley, too expensive and you always have to take your toolbox” So may be the MT03?! My 06 MT-03 is for sale, Edinburgh. Hello jeffers! Guided by you, I just brought my own MT-03 here im Brazil, and I’m very happy with it!!! Thanks a lot. By the way, can you send again the link for the center stand? The link somewhere above doesn’t work. Also, if you have the link for the wind shield, it will be of great help. I’ve now sold my MT. But I have a Yamaha rear rack, an SW Motech centre stand, a new seat, and a new petrol tank available to sell. See the MT Owners Forum for details! I’ve had an MT-03 now for a good 4 and a half months, and done just over 6000 miles on it. Ridden it in all weathers including snow and ice, and all roads tarmac, it is an incredibly capable and versatile bike When I first rode it I was very unnerved, having just traded my XVS650 Dragstar in for it. When I first rode the MT, I/it was very upright and very jerky to start off with because of the high torque, but as soon as you get to know the bike and where the sweet spots on it are (which doesn’t take long at all – I was loving it before I had covered 10 miles!) then it’s a doddle. If you’re looking to tour the country or even several countries, there are better bikes for the job. Riding rediculously economically doing 75mph on a motorway from a full tank (10 or so litres until reserve) I managed almost 110 miles before the fuel reserve light came on. It is a bike built for thrashing on the back streets and leaving sports bikes behind on a country road. Which is always satisfying. 🙂 After a 320 mile round trip, my shoulders were aching from the constant buffeting by the wind – probably my own fault for only stopping for fuel and carrying on straight away – but even when you are riding after a long boring motorway ride, when you get to whatever destination you choose, you are instantly re-awakened by how fun this little bike is! In 1st gear it will easily pull the front wheel up just on the power for the amount of torque available to you – that torque is also very handy when you give it a bit much, brings you back down easily to get your nerves back. Cornering takes a little practise to refine for the upright seating position, but once you get it right, there is very good ground clearance – the footpegs were scraping and there was still about half an inch of “chicken strips” left on the edge of the tyre (those have since been worn away :D). Top speed, once again there are many other bikes more suited to the job as flat out on the motorway I managed 109mph before bouncing off the rev limiter. It is a bike built to be thrown around and it seems the more you push it, the more it encourages you to push further. All in all, if you want a fun commuter that will give you just as much fun in the countryside as it does blasting away from the lights in town, then this is the bike for you. Hi, i have just been reading over the above. I have not been on a bike for over ten years, back when i had a 125cc on the road as a learner. I had to come away from bikes due to becoming a daddy, so have been using a car ever since. I have always had an interest in bikes, from lower 125cc to mid range and bigger speed bikes. Sorry… so anyway after ten years or so i am going to do it and buy a bike. i have passed my theory and have both my CBT ans DAS booked, soon. As i have been away from bikes so long and have never been on any thing other than a 125cc, would i have the skills to ride and kep in control the MT-03. i love the look of the bike and have been happy with the reviews i have read. but should i stay lower in power? also i will need to use the bike in most weather througout the year. alot of reviews say that they put their bikes away in the winter, would the mt03 be able to cope with windy, wet, and the other elements winter has to offer. i am not looking to a fast bike but love the looks and want something with a little punch but is also forgiving of me the riders, little mistakes. Thanks very much any fb would be great. I’ve had an MT-03 for 3 months now and covered nearly 1500 miles. Been riding for 25 years on just about about every type of bike, currently have an old school GSXR1100 + KDX200 enduro. I was looking for something totally different to the Gixer to use through the winter and after one test ride on the MT knew it was for me. Although totally different style and engine it has so much in common with the LC’s I used to hoon around on in my youth – an absolute blast and punches above it’s class so to speak. In it’s element on the twisties and around town, certainly not embarassed on A roads, I even enjoy wet and leafy single lane backroads on a Sunday morning. Since I’ve had it the poor old Gixer has been confined to the garage most of the time as the MT just begs to be ridden, even wet and windy weather is fun! It’s been on a 550 mile in two days round trip to Cornwall and a track day, will be doing both again. Definitely off to France on it next year and gonne line up some more track days. I’ve added Leo Vance end cans (lovely sound) and K&N, larger front sprocket and brighter headlamp bulb. Not ideal for long motorway blasts, 45 minutes at 85mph was literally a pain in the neck but pretty much any unfaired bike would be the same. Good two up for an hour or so. Obviously not a speed demon but pulls to 90mph+ in all conditions, a bit more if you can wait for it. A decent rider on a decent sportsbike will leave it but not by that much unless long straights, on a wet track I was able to keep up with all but the quickest riders. Bought it as a ‘stop gap’ to use through the winter and then sell on for something else next Spring, right now I wouldn’t even consider getting rid next year, it’s a keeper. live in brazil.i have a mt 03,since okm.Bike is fantastic.Ride always with my wife distances 500/800km.No problems;Completely fun,tork and wind in face.Dont sell.I am a rider +/- 35 years ago. Hi everyone. Im from Hungary. I would like to buy an MT-03 in the future, and its nice to read these beautiful things about it. My problem is that i am 6 ft 5 in (195 cm) tall, and this is a little bike i think, so i dont know if its comfortable or not or i wont look like a giraffe when i ride it. If anyone have this type of experience, please share with me. Helmet Hair – Motorcycle Blog	Powered by WordPress 71 queries. 0.619 seconds.